After a prolonged absence a Snowy owl has been recently seen on Fetlar. Fetlar Museum Trust who operate Fetlar Interpretive Centre have launched a new promotional leaflet for 2018. We did not receive any correctly completed crosswords, the prize will be retained for another event in future. For those desperate to see the solution please see the pdf. The 2017 Fetlar Christmas newsletter is now available. Following a successful participatory budgeting event, Community groups in Fetlar were £6000 better of. Fetlar Developments is currently seeking a Book Keeper. Fetlar Community Council has been successful in securing funds to deliver a Participatory Budgeting project. Fetlar resident Avalina Kreska has just had her debut Fetlar novel "The AdderStane" published. North Isles Awards. You may have seen some information in last weeks Shetland times. More info now available. Recently both a Swainson's Thrush and a Whites Thrush have been seen and have attracted a lot of interest among birders. Avalina's debut novel 'The AdderStane' is set on Fetlar; she's hoping to be published later this year. HIE have produced a short video on the Fetlar Wind project and the Fetlar Green Energy scheme which the turbines power. Peter Sawford from Fetlar and Jim Tait from Lerwick did well at this years Scottish open surf kayak championships. Fetlar recently hosted a junior disco, bringing together kids from all three North Isles. This past weekend was a busy one for Fetlar. There were two cruise ship visits on consecutive days. the first that have been for many years. The cruise ship Hebridean Sky is due in Fetlar on 23rd May. The hall will be open with craft displays and the Interpretive centre will be open until around 6pm. Fetlar Interpretive Centre will be closed on Saturday 14th May 2016. Sincere apologies for any inconvenience caused. We are delighted to let you know that our webcam is now online and available to view on the webcam page. Revised Croft House Grant Scheme Opens. increased levels of support for new houses or the rebuilding or renovating of existing houses. Fetlar Community Association have been successful in a recent bid to the Climate Challenge Fund. A group of people from Fetlar interested in a community growing project recently visited Turriefield. To gain inspiration and ideas from Penny and Alan. Fetlar Community Association Questionnaire. Urgent response by residents required. If you need another copy you can download one from the link provided. Work is now underway installing the bases for the Fetlar Wind turbines. Bonfire night postponed due to weather. Now to be held on Saturday 7th. Fetlar features on the BBC's Grand Tour of Scottish Islands. Series 3: Episode 6.Northern Exposure: The North Isles and Out Stack. Fetlar Primary School has been awarded a Level 1 Rights Respecting School Award by Unicef UK. The smallest school to have done so in the UK. 30th June 2015 An end to timetable confusion? Are you bemused, confused or just plain frustrated by the inter island ferry timetable? Well there may be a solution. Fetlar Primary Schools easy to use ferry timetable may be the answer you have been looking for. Pete Sawford recently qualified for the Surf Kayak World Championships to be held in Spain from 29th June until 5th July. He has also been selected as a member of the Scotland at the event. Fetlar's red necked phalarope population have started to return from their impressive migration. The first bird was seen on the 18th and a number of further sightings have been made since then. Fetlar Community Council have secured �3000 for a Community Development distribution fund for the current year. Something to brighten up your Monday some fine tunes by Haltadans with accompanying video shot in mainly Fetlar including some beautiful footage of the Aurora. Pete Sawford from Fetlar qualifies for Surf Kayak World Championships and is selected for the Scottish Team. St Helena, one of the Commonwealth Countries and Territories we linked up with during our Commonwealth Celebration event last year has been featured in a BBC Documentary. Historic Scotland has pledged a contribution of �460,000 towards the restoration of Brough Lodge, the A-listed house in Fetlar. The offer of grant, warmly welcomed by the Brough Lodge Trust, will meet 11.5% of the total cost, which is estimated at �4m. Two ten year olds, Joshua Painter, from Fetlar Primary and his friend Kieran Brown from Baltasound Junior High School in Unst, rode the 7.5 miles from the ferry terminal at Hamars Ness to the Banks of Funzie. They were raising money for the charity Water Aid which provides clean drinking water to communities that are reliant on dirty water. A newly refurbished self catering property is now available in Fetlar. The Lodge which is within the grounds of Leagarth Estate , is centrally located and offers uninterrupted sea views. Last weekend saw The Boys of the Lough most ably supported by Haltadans and Megan & Lauren from Yell entertain an appreciative audience at Fetlar Hall. Funzie one of UK's top 100 geological sites, published by the Geological Society. The North Atlantic sessions concert went down a storm in Fetlar. Now the community is looking forward to two more great events. A busy July for Fetlar, on the 19th the north Atlantic sessions roll into Fetlar for what is looking like a fabulous concert. On the 26th Fetlar fun day and the first of our celebration week events. The Commonwealth Celebration gets up to full sped on Monday the 28th running through until Saturday the 2nd of August. The first of Fetlar's small breeding colony of red necked phalaropes have returned to the island. Only a few so far but no doubt others will follow shortly. Notice in effect from May to October. During this season Fetlar Aerial will be flying a drone for archaeological survey work around the island. The drone is white in colour - about 1 foot across displaying Red and Green lights. Tresta beach has been recognised by the Marine Conservation Society for the quality of water at the beach. This accolade adds to the Seaside Award which the beach has held for a number of years now. National and local media has been buzzing with the news about Fetlar's far travelled phalaropes. Malcie Smith from the RSPB said "Its fantastic that phalaropes from Fetlar take part in one of the worlds great migrations"
There is a high degree of expectation in the community regarding the forthcoming Fetlar Primary School Christmas Spectacular. Fetlar school has recently been inspected and has achieved "very good" in all inspected categories. Fetlar Youth club recently held a successful fundraising even and Fetlar Interpretive Centre's open day proved popular with shoppers. Shop till you drop in Fetlar on Saturday 2nd November. The Fetlar interpretive centre will be open from 11am to 4pm hosting a local craft fair featuring products "Handmade in Fetlar", perfect for Christmas presents. The summer 2013 Fetlar newsletter is now available for download from the the following link. North Isles Community Broadband project information will now be distributed via a new website which has recently come online. A round up of the latest news. Despite a very misty day and a power cut ! Fetlar fun day was hailed a great success. Fetlar fun day on July 27th. A great day out for all the family, there will be lots of activities available during the day starting at around 11am. See our fun day page for full details In the evening there will be fish suppers at the hall, with Country Rok providing the music in the evening to round off the day. We know ferries may get very full, but transport will be available throughout the day. Fetlar�s new electric minibus officially goes into service today providing the islands dial a ride service, in a partnership arrangement between Fetlar Developments Ltd and RG Jamieson and Son. Following its arrival in Fetlar on the 26th of June, it has undergone a period of testing and driver training prior to going into service. Fetlar's electric minibus finally arrived on the island on Wednesday. The minibus, a Smith Edison is based on a Ford Transit and can accomodate up to eigtht passengers plus the driver and can carry up to 2 wheel chair passengers. Increasing concerns over broadband provision in the North Isles prompted recent discussions between the Unst and Fetlar Development officers with representatives of Shetland Telecom and Shetland Broadband to see what options were available for an improved Broadband service in the North Isles. 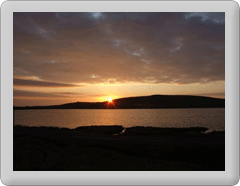 Fetlar Campsite now under new ownership is open for the 2013 season. Fetlar Developments Ltd. is pleased to announce the launch of a newly developed media resource on its website, www.fetlar.org. Designed to provide information on a host of topics - including history, nature, and community life on Fetlar. Fetlar Interpretive Centre opens today for the start of the 2013 season. Opening hours are Monday to Friday 11am to 4pm, Saturday & Sunday 12.30 - 4pm. Fetlar Community Council are seeking views on the new proposed timetable for the Geira. Please get in touch with the clerk or any of your community councillors to feedback your thoughts on the proposed changes. The RSPB have launched a new red-necked phalarope pin badge. We understand that this is the first pin badge featuring the phalarope that has ever been made and is already attracting considerable interest from pin badge collectors and wildlife enthusiasts. A roundup of news from 2012 and looking forward to 2013. Wishing all our readers a very Merry Christmas and a Happy New Year. Fetlar is looking forward to the official opening of its new pier on Saturday 1st December. Fetlar Developments is recruiting for a new Fetlar Tourism Development Officer post. Shiver me timbers ! Parrots, Cutlasses, eye patches and flambouyant clothes were all in evidence at the fantastic Pirate Night held recently at Fetlar Hall. As the 2102 season come to an end, the Cafe is scaling back its opening times. Please check the cafe page for the latest information. Fetlar Developments Ltd is very pleased to have been awarded a grant by The Village SOS fund. The grant will provide funding for one year, for a part time Fetlar Tourism Development Officer. Their role will to be to act as a focal point for the development of the Fetlar tourism sector. Fetlar Sheep Dog trials. Monday 13th August. Please note the venue for the trials has been moved to TINGWALL for 2012 only. Start time is 0930. Fetlar Aerial Photography has this morning launched its website at www.fetlaraerial.com. Sarurday 23rd June should be date for the diary. From 8 pm Fetlar hall will be hosting a Simmer Dim Cocktail night, featuring a range of delicious Alchoholic and Non Alchoholic cocktails.